Buddha's right hand downward, the middle figure gently touching the earth so called "position of touching the earth" ( Bhumi-Sparsha mudra). 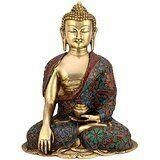 A wonderful, serene, beautifully figure of Bhumisparsa buddha, the enlightened one.The Bhumisparsha Buddha is known to Bring prosperity and happiness in your home & Office.A powerful fengshui decor addition to any home.Made from Quality Bronze and Beautifully Handmade in India by our expert artisanSize : 12 Inches Height X 10 Inches wide X 7 Inches depth. Weight : 5.6 kg. Material : Brass, With Turquoise and other coral stone Handwork..-------------- Pls beware from Copy product & ensure buying authentic product. This is exclusive inhouse design & product of Brand "Collectible India" and "covered by intellectual property rights laws". 'Collectible India' doesn t authorize any other Brand/Seller to sell it and we won't be responsible if any counterfeit or substandard product send by any other seller.